I’m A Disney Dad – Are You? I recently found a new website called “Disney Dads” which is hosted and founded by John Flynn, a senior VP at the Walt Disney Studios. For anyone who is a dad I highly recommend it. The site is not as Disney-focused as you might imagine with a name like Disney Dads, but instead focuses on engaging stories of fatherhood with plenty of Disney thrown in. It’s an inspirational online magazine for dads of all kinds who are committed to being the best fathers they can be. What really got me interested in this website was the purpose behind it – to encourage and model fatherhood today. I think about how important family is and specifically the role of the father in the family and there just isn’t enough OUT THERE to focus on dads and model for them the kind of parent they could be or why it’s so important. The stories on the website focus on those things. And I love their tagline, “Because great dads make a big difference.” They do. They really do. So many studies have been done and so many articles written about how much of a difference it DOES make in the lives of children to have a father who is aware, involved, and active in their children’s lives, yet for all of the research, society hasn’t exactly caught up. We don’t give fathers enough of the tools, the resources, and the support they need nor do we emphasize their importance enough in the lives of their children. I feel like Disney Dads is a step in that direction. 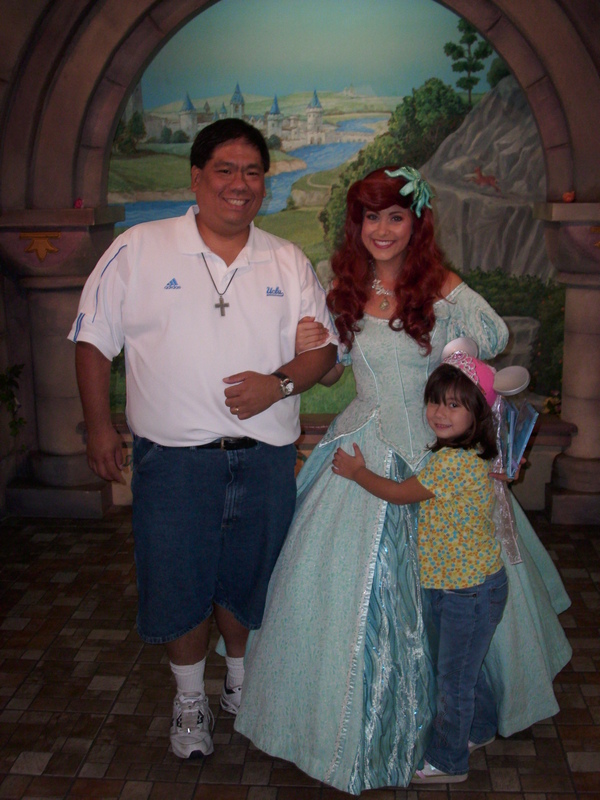 Having a Daddy / Daughter Day at Disneyland with our friend Ariel. Spent about 45 minutes in line for a photo op – but it was worth twice the time! I also, admittedly, like this site because of its Disney connection. The image that sticks in my mind – the image of what appeals to me as a “Disney Dad” – is this image of Walt who built an entire theme park with the express purpose of creating a place he felt he could take his daughters. That’s the kind of parenting I believe in – a father who would spend millions of dollars and thousands of hours to create a place he felt good about taking his children to. It’s not the money he spent that made Walt an impressive father and I’m sure he had faults and imperfections like the rest of us, but it’s his dedication and love to his children that are inspirational. Most of us can’t afford to build a theme park for our children, but we can spend time with them. We can love them. And we can nurture them. I have been blessed to have two daughters I am very proud of – Eve (who is technically my stepdaughter although I don’t really think of her that way) and Emma. Watching them grow and mature has been one of the greatest joys in life. Eve moved away recently for school and is getting to spend more time with her biological dad and I am so glad he is being such an active parent. Anytime a father can become more involved in the lives of their children is something that should be encouraged and supported. One thing I like to do is have Daddy / Daughter Days. My little girl Emma and I have spent many hours together – just the two of us – while mom was busy or on a business trip or doing something important and I have loved every minute of it (not Cassie being away, but getting some one-on-one time with Emma). Typically, because I do love Disney, many of those hours are spent doing Disney-related activities like going to Disneyland together or having a sundae at the Disney Soda Fountain and Studio Store or seeing a great Disney movie, and each of those times have a special place in my heart. So I hope to encourage you to have your own Daddy / Daughter Days or its equivalent and spend time with your kids doing whatever it is YOU like to do. Share your passions and joys in life with your children (assuming it’s kid-appropriate). You may not be able to build them a theme park, but if you involve them in your life, it will build memories that last a lifetime!